This article is part of a series about setting up a home server. See this article for further details. Surprisingly, this is one of the easiest bits. If you don’t mind sticking with the options presented by the GUI, Back In Time makes backups so simple it’s almost criminal not to use it. The use of the GUI itself is fairly straightforward so I’m not going to go step by step and instead go for the important bits. Just make sure you use the root shortcut (Back In Time – root) to prevent any permissions problems. I’ve used NTFS for the backup volume because it supports hard links and is readable by Windows machines if something goes wrong. A native Linux file system would be preferable for many, but whatever you do don’t use FAT32 (FAT32 doesn’t support hard links, so every snapshot would consume 100% of its size whether the file was changed since the last backup or not). This is all done in the settings menu, which isn’t labelled but represented by the classic screwdriver and spanner icon – intuitive enough. Under General, make sure you’re saving snapshots to your backup volume. Set the schedule to whatever you like, but I prefer to handle the schedule manually as it doesn’t give enough options. For a desktop machine the “daily” option would make sense, but as this machine will be on 24/7 I want it to run at a set time each day, not whenever it feels like it. So we will setup a cron job manually later. Under the Include tab add your data folder (/media/data). Under exclude I removed all the preset options as I want everything on the data volume backed up. Everything that is except the lost+found folder, so I would suggest clicking Add folder and adding “/media/data/lost+found”. The auto-remove options are up to you. I set the free space threshold to 1Gb, checked the smart-remove box, and chose not to remove named snapshots as they all seem fairly logical. The expert options don’t really need tweaking unless you want to do different schedules for different folders. Click OK to save and you can now take a backup. The crontab is like task scheduler on Windows, but arguably a lot more powerful and flexible. The ‘-e’ option just tells crontab to edit the existing crontab instead of overwriting. 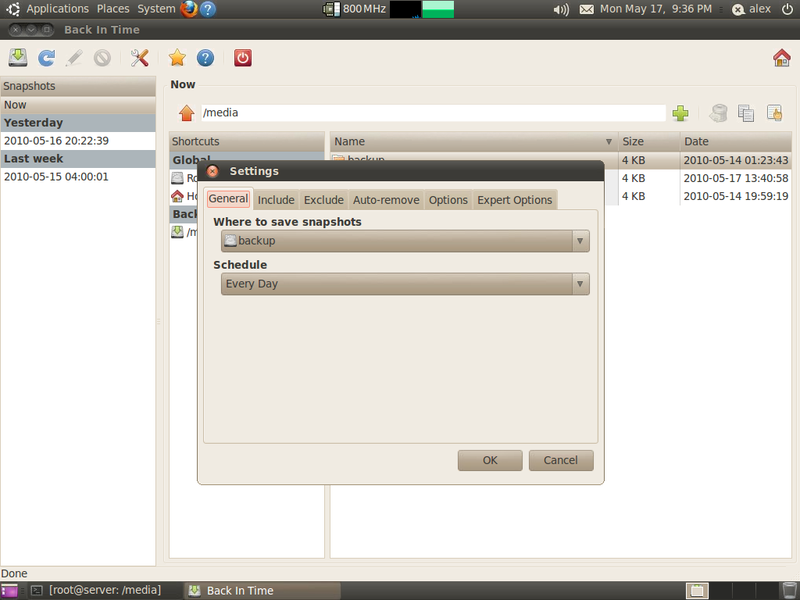 The screenshot below shows my crontab. Later on we will modify this to also email the result. I just discovered that the Back In Time gui blitzes any lines in the the crontab that contain the string “backintime” whenever you click OK from the preferences window. This is a rather annoying problem, as I can easily see this happening. 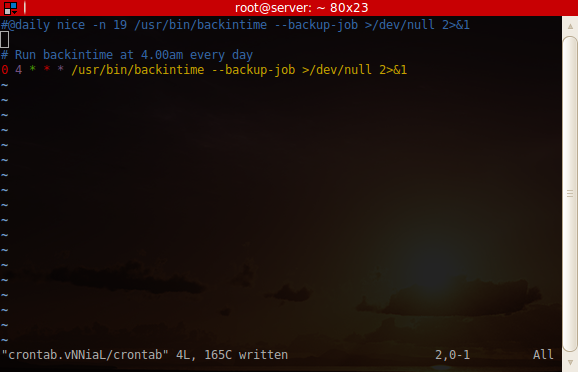 I recommend making sure the gui schedule is set to every day rather than disabled, which means that if someone does fiddle at least the backup will still happen once a day. The solution to this is to call a wrapper script which does not contain “backintime” in its name… I’ll update this once I’ve written and tested it. This entry was posted in Articles, IT, Linux and tagged administration, backintime, backup, home server, linux, lucid, ubuntu on May 17, 2010 by Alex. In this section we will create accounts for each user that will access the server, create a folder for each user, make sure the permissions are sane, and configure the samba shares. For home environments a single user account that everyone uses can be good enough. However I like to have some semblance of security to raise barriers for viruses (who knows what’s going to be connecting to the network), so I setup guest to be read-only and assign write permissions only to authenticated users. For some reason NeatX breaks policykit, which means any buttons in control panel applets that require root privileges will simply fail to work. The way around this is to run the applets with gksu. The most convenient way to do this in my opinion is to create a desktop shortcut. Go to System > Administration, right click on the users and groups icon in the menu, and “Add this launcher to desktop”. Next, right click on the resulting desktop icon, click properties and in the “Command” field, prepend gksu so that it reads “gksu users-admin”. Double-clicking on the icon should then prompt you for your password, and all the buttons will work. Hopefully in the future this won’t be necessary! I also created desktop shortcuts for Disk Utility and Back In Time (root). Creating users is simple enough, but afterwards we need to add the users to two groups – “sambashare” and “users” (you should be able to figure this out). After doing this, go to Advanced Settings > select the Advanced tab and change the main group to users. The reason for changing the primary group is so that any files the user creates are also accessible to others in the users group – which will include anyone that we want to be able to access files on the server. If you want to keep files private it is best to leave the primary group as the user name. Old school Unix people tend to know this, but for Windows refugees the lower level Linux concepts such as user groups and file system permissions can seem a bit strange, as they work quite differently. The octal permissions are 755, which means read/write/execute for the owner, read/execute for the group and all other users. For newbies I must confess that the rwx permissions notation is easier to understand, but unfortunately I learned octal permissions and it’s become a habit! Repeat this for each user (substitute the user for “mum” in the example above). Note the use of the -R switch which applies the command to all sub-folders and files. Remember to make sure the primary group is the user name as well. I’m not 100% sure I’ve done this the officially sanctioned way, especially since it involves the decidedly old-school method of editing smb.conf. However for anyone comfortable with the terminal I think it works perfectly well. First open /etc/samba/smb.conf in your favourite text editor (my preference is vim). There’s no need to modify any of the configuration, so scroll down to the bottom where the shares are located. I always comment out the printer shares (print$ and printers), as sharing printers via samba is a fool’s errand in my opinion, just get a blimmin’ network printer. Some explanation is definitely needed. Firstly while [Data] allows guests and the share is not read-only, guests will not be able to write because of the file system permissions which only allow the owner and group to modify files. You may want to create a public folder with permissions 777, which would allow guests to copy files on to the server. Or you may want to set up a another share and change guest ok to “no” for the data share. The backup drive is read-only because I don’t want anyone to modify files on the backup drive, and file system permissions are no protection due to it being NTFS (Linux doesn’t and really shouldn’t support NTFS permissions). It would be too easy to go back to a previous version of a file and accidentally save it, and I’m not sure how Back In Time would handle a backed up file being newer than the source. Altering a file in the backup would also change every linked copy, so basically writing to files on the backup volume is bad mmkay? It is shared only to make restoring previous versions convenient. I haven’t covered setting up NFS here, as Mum and Dad both run Windows machines. If you do decide to setup NFS it’s fairly straightforward, but to save yourself some pain make sure the user ID’s match on all machines – NFS matches uid and not the actual user name. Off the top of my head the packages to install are nfs-common and portmap, and the config file to modify is /etc/exports. If you need to restart samba you can do so with the command ‘service smbd restart’. This entry was posted in Articles, IT, Linux and tagged administration, home server, linux, lucid, samba, ubuntu on May 17, 2010 by Alex.